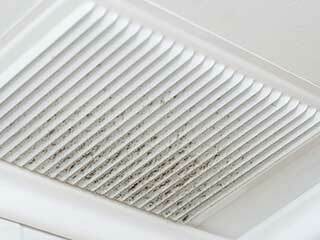 Home Our Air Duct Services Residential Air Duct Cleaning Is Mold in My Air Ducts Dangerous? So, you’ve spotted or smelled mold in your ductwork. Maybe you had the sample lab-tested, maybe you’re sure it’s the real deal. Either way, the ‘lungs of your home’ are infested and need to return to their healthy state. After all, the air circulated through these ducts is the same air you and your family breathe every day. But just how dangerous is mold? Where did it come from in the first place? Read on to find out. Why Is There Mold in My Ducts? Mold and mildew cannot grow without moisture. If the interior of your air ducts holds plenty of moisture and a mold spore from the outside lands on it, it will begin to grow and spread. Over time, and in excessively-moisturized conditions, mold can become a serious problem. But, as long as the source of moisture remains controlled, the mold will stay away from your drywall, wood beams, and even the duct system. If there is a substantial mold infestation in your HVAC system’s components, chances are your health will be at a risk, too. Mold can create very unhealthy conditions which exacerbate adverse symptoms of illnesses, trigger allergies, etc. It is, therefore, very important to have your air ducts professionally cleaned and treated as soon as mold has been detected. Handling the job on your own will produce results that aren’t even close to those a professional can achieve with specialized deep-cleaning tools and knowledge. What’s more, unattended mold can spread not only through your HVAC system, but through your home, as well. Once mold has grown around the ductwork, vents, and registers, its spores will spread through your home and continue growing. For people who are dealing with mold infestation in their duct system, a cleaning and treatment service is due. Leave the issue in the hands of a professional, rather than trying to address it yourself. After your ductwork has been cleaned and mold removed, you may want to coat your ducts to prevent spreading of mold in future.